A black and white negative of a portrait of John Strickland. Brian Winter took a photograph of the original portrait that is held in a private collection. John Strickland was born in Rosedale, Yorkshire, England on 10 December 1807. He married Hannah Pierson in Lastingham, Yorkshire, on 28 April 1832. They had eight children: Margaret (1832-1859), Nancy (1834-1886), Mary (1837-1887), Hannah (1838-1916), Jane, Ellen, Elizabeth (1841-1913), and Sarah (1852-1939). 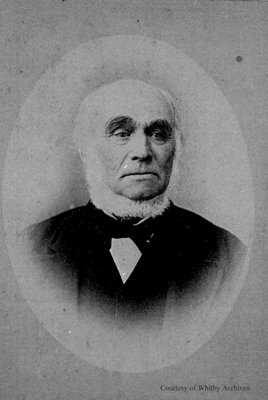 John died on 11 June 1896 and is buried in Union Cemetery, Oshawa, Ontario. John Strickland, December 10, 1881, Photographer Unknown. Whitby Archives A2014_005_010B.